Welcome to the May Newsletter. 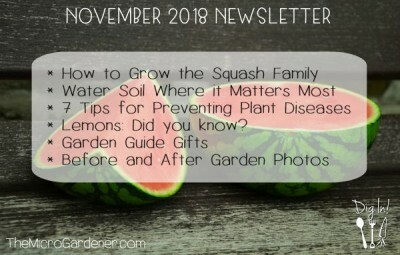 Lots of quick tips to get you thinking about the food you eat and grow. This month, I’m sharing another quick ‘How To’ video in my Sow Simple series of free tutorials to help you grow an abundant, healthy garden in just minutes. Dig in and help others by sharing these tips! In this video clip, I share ways to enjoy the health benefits of beautiful beetroot with simple ideas for eating leaves, roots and stems. My friends, John and Ocean Robbins, just hosted a wildly successful Food Revolution Summit that drew more than 250,000 people. I hope you listened – it was inspiring and enlightening. If you missed it, they’ve decided to offer the entire Summit for a special encore weekend, May 12-14th (US time). It’s 100% FREE – CLICK HERE to LISTEN NOW! 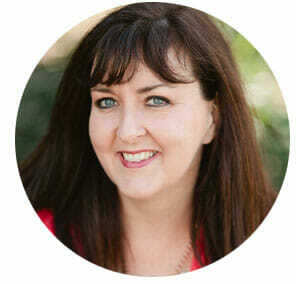 You can listen to powerful tips to get over food-related struggles like depression, excess weight, low energy, and poor sleep plus so much more. CLICK HERE to listen to the Food Revolution Summit now. Be quick, because the Encore Weekend ends on Sunday night! 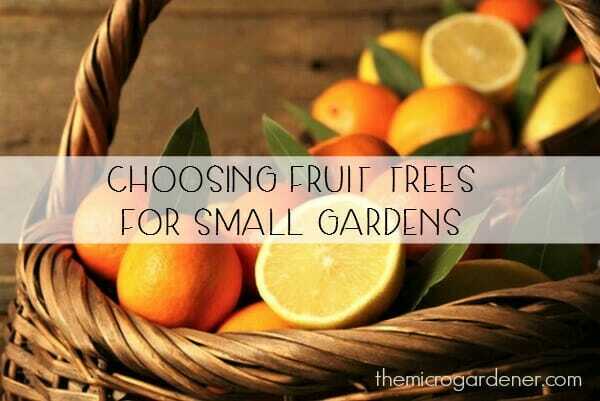 Dreaming of growing your own fruit trees? Harvesting juicy homegrown fruit is one of the most delicious rewards any gardener can enjoy. I love snacking on berries in my garden or picking a juicy peach with the sweetest flavour. There’s something so satisfying about putting your own fruit on the plate. 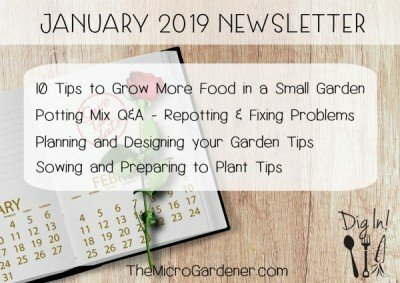 In my latest article, I share 5 key tips on what you should consider when planning on productive fruit trees for small garden spaces. CLICK HERE to read now. I have a passion for sharing ways to get the most nutrient value from your food. Not only if you grow it, but also when you buy, cook, store and preserve it. According to Jo Robinson, author of “Eating on the Wild Side: The Missing Link to Optimum Health”, you can increase the nutrient-value of many foods you eat. This book is a favourite in my home library. Cut the head into individual florets and eat as a snack with your favourite dip instead of crackers. Add to salads with a tasty dressing for a delicious crunch. I think it’s especially delicious with nuts and toasted sunflower seeds. 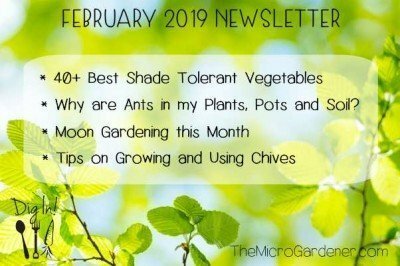 Grow or eat baby broccoli as microgreens. 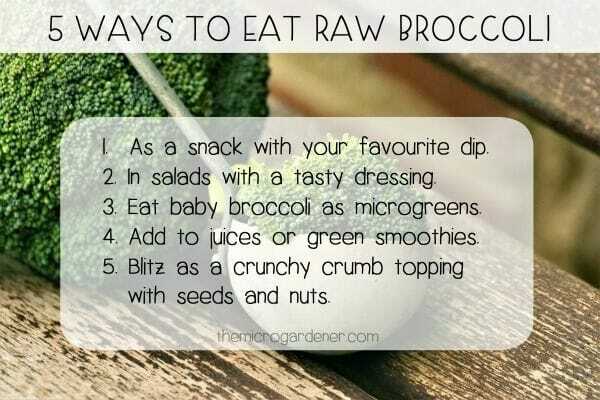 Don’t wait months for a plant to mature and produce a whole head of broccoli! 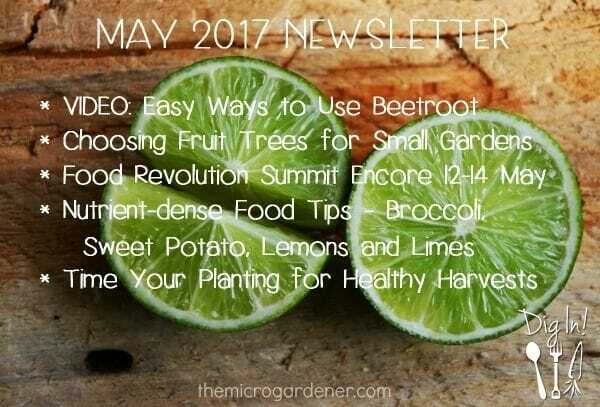 You can harvest broccoli microgreens in 2-3 weeks (depending on when you sow your seeds). Or buy them. Simply snip onto salads and meals to add digestive enzymes, just before serving. Juice broccoli with other vegetables like carrot and beetroot for a refreshing drink or add to green smoothies. Yummo! Add raw broccoli florets, toasted walnuts or sunflower seeds and a sprinkle of your favourite seasoning* to a food processor. * I use a pinch of Himalayan pink salt or nutritional yeast flakes (which taste a bit like parmesan cheese). Blitz for about 30 seconds until a fine crumbly texture. No one will ever know broccoli is hiding in your crumb topping! Use as a raw sprinkle over potatoes, salads, vegetables or any other dish. Sneaky, I know … but it works! Skins contain more nutrition than the flesh, so eat the whole sweet potato. Now I grow mine, so they’re organic of course. So I don’t have to worry about any toxic chemicals commonly found in conventionally grown sweet potatoes. If you buy yours, please choose organic or else you’ll miss out on these nutrients. Otherwise you should peel them. Just remember, some chemicals used in conventional farming are systemic. That means they are absorbed into the entire vegetable not just the skin. No amount of washing or scrubbing can remove them. 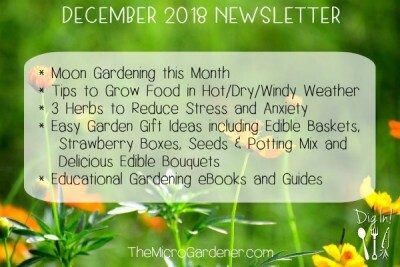 Another reason to grow your own! Steam, roast or bake sweet potatoes, rather than boil them. Why? These cooking methods can double their antioxidant value, whereas boiling reduces it. Antioxidants provide many beneficial health benefits including helping to build your immune system and prevent many diseases. 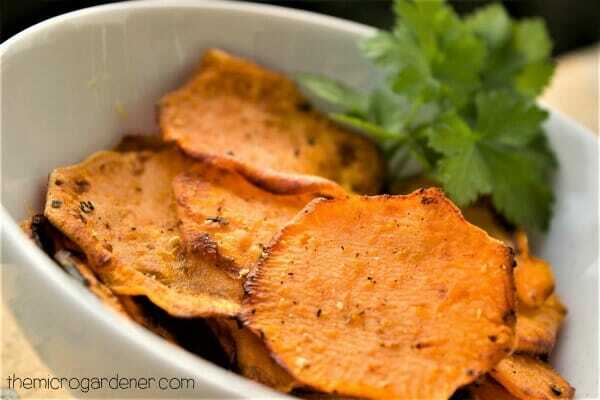 Crispy sweet potato chips are a delicious way to enjoy this nutritious vegetable. Don’t you feel like reaching into that bowl and crunching on them? 3. LEMONS AND LIMES – These juicy citrus fruits are packed with vitamin C and compounds called flavanones, with antioxidant and anticancer properties. These are a daily addition to my diet for health reasons but citrus are not available in season, year round. So how do you best store them and get the most nutrient-value? Ideally, grow your own – even in a pot. At least for some of the year, you will have fresh fruit with maximum nutrient value. When buying lemons and limes, colour will tell you a lot about how ripe they are. Did you know that the darkest green limes have been picked when immature? That’s so they will have a longer shelf life. The fruit you buy, may not be as fresh as you think! They’ll also have the least juice. Ripe, mature limes are actually yellow, not green! Look for fresh, firm fruit with glossy skins. Pick several fruit up and feel how heavy they are for their size. The heaviest ones will have the most juice. Lemons and limes are best kept in the fridge for up to a couple of weeks. If you want to preserve the juice, squeeze and freeze in ice cube trays. This helps preserve the phytonutrients and flavour in the juice. Don’t waste the skin. Zest or peel it and freeze too. Add to herbal teas, poached fruits or when baking. Or dry it and grind into powdered vitamin C.
Did you know lemons can help preserve the nutrients in other foods? Pretty cool hey! 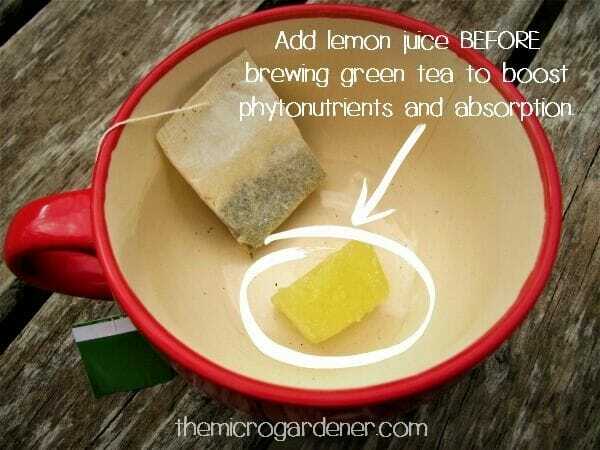 If you add a dash of lemon juice to your cup or teapot before you brew green tea, this magnifies the phytonutrients in the tea and your body’s ability to absorb them. Did you enjoy those tips? Let me know in the comments. 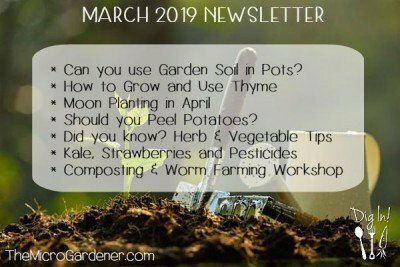 One of the ways I maximize production in my garden is by timing WHEN I sow, transplant, fertilize and propagate in harmony with the moon phases each month. Why? Because the soil moisture and plant sap changes with the gravitational pull of the moon. I just tune into the best times to use that to my advantage – and you can too. Read what other gardeners have experienced when timing their activities with the moon cycle. 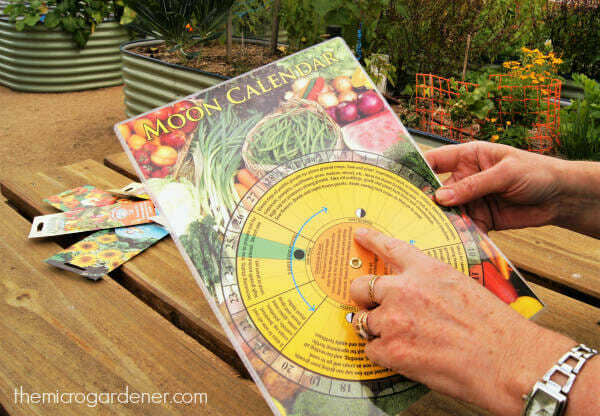 CLICK HERE to get your own Moon Calendar Gardening Guide. If you’d like to support this site with your purchase, we have updated the credit card options. You can now pay securely by credit card with Stripe as well as PayPal. If you need help or have any questions, please visit the FAQ page or contact me. If you missed the tips in my last newsletter, CLICK HERE. For all past newsletters, CLICK HERE.